I found myself cleaning out my fabric closet today (yes, sad to say, I have enough fabric to justify having an entire closet devoted to it). I’m culling the fabric herd, so to speak – my mom is going to start quilting again after the holidays, and I offered her a bunch of my fabric, since I’m currently not using it. So that’s part of her Christmas present. Anyway, I’m going through the fabric closet and pulling stuff for her, and after that’s done, I kind of get carried away and start going through the little bit of non-fabric stuff that’s in that closet as well. And who do I run across but Bucky Bear? Travis and I, in our non-married life, wound up accumulating a lot of stuffed animals. A lot were ones that I had from when I was a kid (I never played with dolls, only stuff animals), and we’d randomly add another to the club – mostly turtles or manatees, it seems. 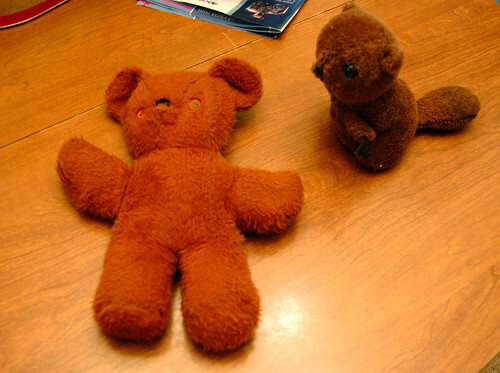 But we both wound up having similar creepy stuffed animals from childhood – mine was a bear that I think originally belonged to my brother, and Travis’ was a beaver. At some point, the creepy bear and creepy beaver met, and we dubbed them “Bucky Bear” and “Bucky Beaver,” respectively. Both animals were creepy and odd, yet still somewhat endearing. We figured they were responsible for some creepy and odd events, and we tried not to piss them off. It was kind of like an “Anthony is going to wish you into the cornfield!” situation. We’re sure Bucky Bear and Bucky Beaver hold mysterious and strange powers, and I want to keep on their good side. So it was with some dismay when I came across Bucky Bear at the bottom of the closet, appearing that he had somehow contracted the mange. I don’t know if he had gotten damp at some point and there was mold on him or what, but it was quite disturbing. And kind of gross. I didn’t want him infecting anyone else, and since Bucky Bear is probably older than I am, I didn’t think he could hold up to the washing machine – I know I probably couldn’t. I didn’t see any other option besides to finally throw him out. But as I was standing at the trash, diseased creepy bear in one hand and the trashcan lid in the other, I realized I couldn’t do it. I had to at least try. If Bucky Bear was game, then so was I. I decided to try the washing machine, chucking Bucky Bear into a lingerie bag and washing him on gentle using the hottest water and the strongest detergent. I’m going to start getting presents wrapped and bagged tomorrow, so I’m not sure if I’ll get the last two scarves I wanted to weave completed. If not, no big deal. I happened to find some of last year’s wrapping paper in the fabric closet, so I figured I could try to use that up first (in order to be environmentally friendly – no good in not using something I already have), and then start making bags for the gifts I have left. I think I’ll start spinning this when Travis gets done plying. I still have my doll Allison. She was bald and a cabbage patch knock-off that mom made the body and clothes for. I couldn’t part with her ever either! Yay for the washing machine. I have my Dumbo elephant, a gift for me given before I was born. I could never bear to throw him away, either! I’ve really been taken by all your woven scarves! 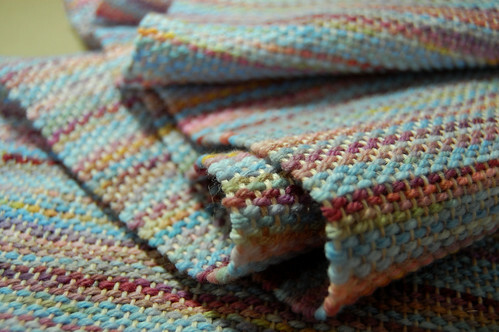 Do you mind posting a picture of the loom you wove them on or directing me to post that shows it? I’ve been mulling the weaving thing over in my mind and I’m sorely tempted to buy a “beginner’s loom”! Gorgeous scarf! 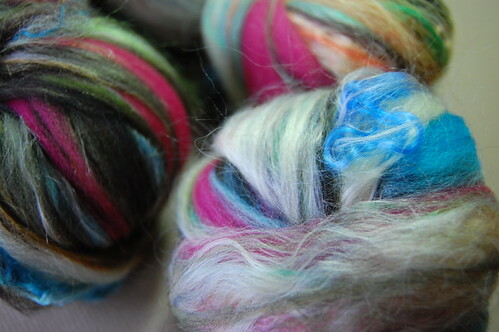 I love the sloppy mess roving balls, too. 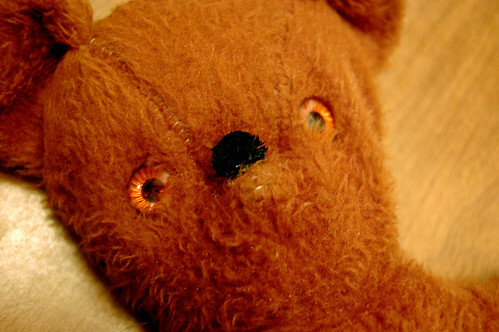 My creepy childhood stuffed animal is Oatmeal, a small white dog with brown ears and spots. So well loved that he has no pile left in his fur, only the crusty polyesters interlock they use to hold plushy fabric together.